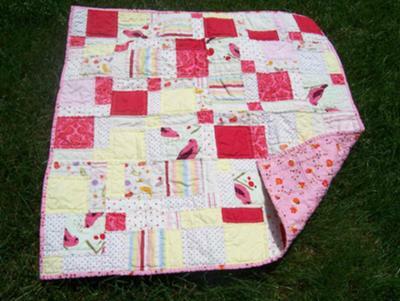 I made this red, yellow, and pink quilt using an extra half-yard of "Birdseed" print that I had from another project. I used a disappearing 9-patch pattern, just sort of randomly arranging the blocks so that the (fussy-cut) birds were roughly evenly distributed across the quilt. My original plan was to have all of the other fabrics be dots or other basic patterns, but another bird print snuck in at the last minute! I machine-quilted about 1/2" inside each rectangle and square and hand-sewed the binding. The finished size was about one yard square. Really nice arrangement of the quilt blocks in this quilt. I love the birds - they give the quilt a modern yet whimsical feel.